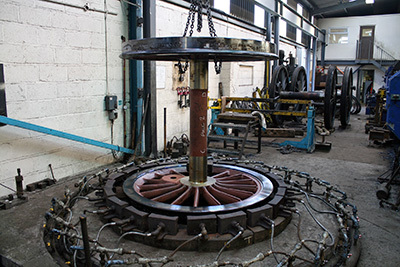 The second cylinder was cast in early March to be followed by fettling and stress relieving before transfer to Williton where it will be machined along with the first cylinder. The six driving wheels now have the tyres fitted and work at Buckfastleigh is now focusing on making and fitting the crank pins. At Bridgnorth we have received spring link and spring hanger forgings from Stephenson Engineering in Manchester for our team to machine. 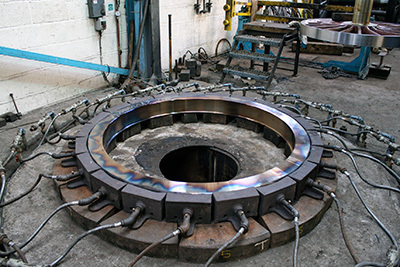 In Sheffield Pheonix Services have fabricated the twelve spring shoe brackets. All these components inter relate to each other and the spring bracket castings, which have featured in these notes in recent months. In the Spring issue of the bi annual 82045 members newsletter we announced that once the riveting of the rear end of the chassis was completed, hopefully soon, construction of the bunker was being considered. We were delighted when a sponsor soon came forward for which we are very grateful and we are currently awaiting a quotation for the fabrication of this item. Other areas where sponsorship would be welcomed are the casting of the pony truck wheels and manufacture of their axles. Due to severe storage constraints we have to approach sponsorship and the manufacture of components in a logical order of the build sequence. Regretfully we cannot manufacture items now that would have to be stored for several years before they can be fitted to the loco. We are running our annual raffle again and this year. Our top prize is two second class tickets on a main line steam day trip. Our winner will be able to choose from a large selection offered by various companies. Second prize is a 32 mile footplate ride together with a family rover ticket and third prize a family rover ticket. Other prizes of Marks & Spencer gift vouchers will also be given as minor prizes. The draw will be held on 19th July 2014 at the Peep Behind the Scenes event at Bridgnorth on the SVR. Tickets will be on sale at the Members & Shareholders weekend in April and directly from me - Mrs Barbara Massau, 4 Southfield, Prestbury, Cheshire SK10 4XF. Tickets are £1 each in books of 5. Please send a SAE with your cheque. Thank you! We were out in force over the Gala weekend, with the main sales stand in the Bridgnorth Machine Shop as well as a presence at our site and also at Kidderminster. Initial results indicate a good response from what seemed to us to be a quieter than usual Gala event, and we will report on the financial results at the AGM on 5th April. We recruited a number of new members over the course of the three days, and were delighted at the many positive comments made about the project. Very many thanks to all those who helped out, including Paul Anderson, Lynn and Dougie Fitton and our Kidderminster stalwart John Gupwell. I would also like to give a special mention to Trust member and Bridgnorth fireman Stewart Smith, who is a tireless recruiter to the cause and is doing his best to cajole some of the younger members of the mpd to put their hands in their pockets, on the basis that they will be benefiting from 82045 long after some of us are pushing up the daisies. Great work, Stewart - keep it up! As most of you will know, the Boiler Appeal was launched in the March issue of SVR News. It is too early yet to give an accurate picture of the results, as donations are still coming in on a daily basis, but I think I can safely say that the boiler account will look pretty healthy when the initial SVR-based appeal has run its course. I'd like to thank Nick Ralls for his enthusiastic endorsement of the project, and, as ever, SVR News Editor David Williams for his unfailing support, which I know he has to balance with the large number of other worthy causes on our Railway. Tony Cousins, who helps me out in the background with a stream of ideas and suggestions, came up with the bright idea that we enclose a Freepost envelope with the Heart appeal leaflet. I hadn't previously understood how this works, but now know we pay only for those envelopes which are returned, at the reasonable rate of 40 pence (soon to go up, of course) per envelope. We thought that this might encourage people to return the leaflet without having to fork out for a stamp, and it will be interesting, when this stage of the exercise is over, to assess how effective this has been. Most of the envelopes have been returned, as we hoped, with a completed Heart leaflet, but, inexplicably, Barbara has received a handful (thank goodness, not many) of returned envelopes with nothing in them at all, and these we will have to pay for. "There's nowt so queer as folk" is an old saying you used to hear a lot in Cheshire, but I am at a loss to understand the mentality that underlies this. Many thanks to all those who returned a leaflet - please keep them coming! The Boiler Appeal is to be continued in stages over the next twelve months (or however long it takes to raise the funds) and I understand that a full-length feature article submitted to one of the leading railway monthlies just before Christmas has been shortlisted for publication, so fingers crossed that a wider appeal will also bear fruit, this time from outside the SVR. The "go-anywhere" nature of this engine means that it is likely to be of considerable interest to other steam railways who will be able to try it out for themselves subject to the agreement of the Trust and of the SVR, and hopefully this will encourage their supporters to join us, too. As Tony reports in his Engineering Notes, the paragraph in the Spring Newsletter about sponsoring the engine's bunker met with an instant response, and this item is now safely on the building list for 2014, bringing the aesthetic benefit of an eye-catching piece of superstructure, plus the very practical and important advantage of being able to fit the handbrake (the handle is mounted on the front of the bunker) when 82045 is a rolling chassis: no-one fancied the idea of frantically waving a sprag and chasing the loco around Bridgnorth yard! And there was more to come: a few days later, another generous member rang, offering to sponsor the bunker. We had a discussion about a possible alternative, and he suggested that he might sponsor the casting of two pony wheels instead. Of course, we enthusiastically accepted his offer - thanks, Dave! This means that Tony will shortly be placing the order for the pony wheels, and with this in mind I wondered if anyone out there might like to match our friend's offer and sponsor the other two at a cost of £5,000 (£4,963 to be exact) in which case Tony will place the order immediately. As work is well under way on the pony truck assemblies, this makes the prospect of a 2-6-2 rolling chassis in the near future highly likely. Please get in touch with Chris if you are interested. Very many thanks to both gentlemen: full details will be given next month. On the further subject of sponsorship, this time in respect of the boiler, Chris has asked SVR Boiler Shop Manager Duncan Ballard to provide us with a list of approximate costings for various components, e.g. 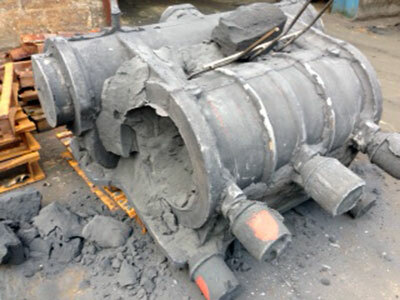 firebox tube plate, smokebox tube plate, throat plate and foundation ring, as well as the inner and outer firebox skins. Details will appear in the updates as soon as these figures are available. 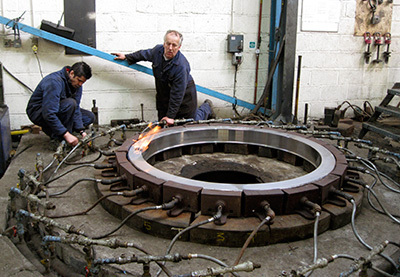 The second cylinder casting being knocked out of the mould at Cerdic Foundries. Photo: Steve Meech.